Protesters rally on the steps of the Texas state capitol on July 28 to condemn the use of fetal tissue for medical research. Senate Majority Leader Mitch McConnell, R-Ky., has voted in support of fetal tissue research in the past. 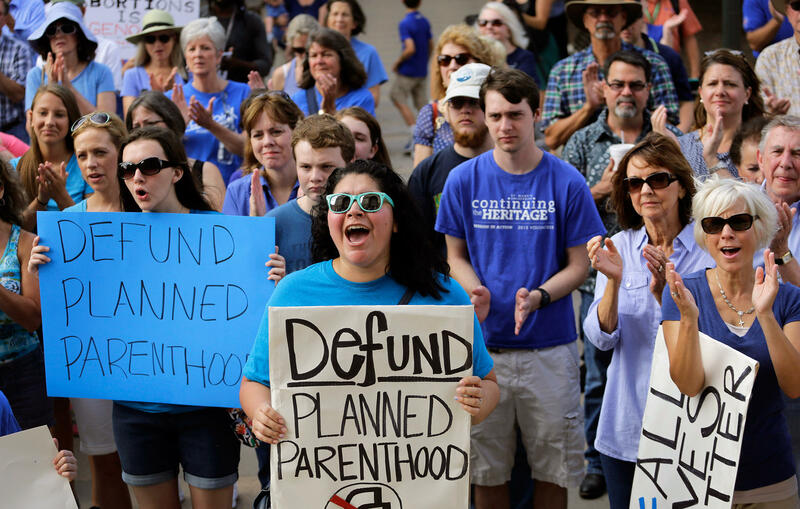 Republican calls to defund Planned Parenthood over its alleged handling of fetal tissue for research are louder than ever. But they are just the latest in a decades-long drive to halt federal support for the group. This round aims squarely at the collection of fetal tissue, an issue that had been mostly settled — with broad bipartisan support — in the early 1990s. Among those who voted then to allow federal funding for fetal tissue research was now-Senate Majority Leader Mitch McConnell, R-Ky.
McConnell made no mention of his previous position when he announced that the Senate would take up a bill to cut off Planned Parenthood's access to federal funds before leaving for its summer break. The Senate blocked the legislation from moving forward Monday night, but the issue may come back with spending bills in the fall. 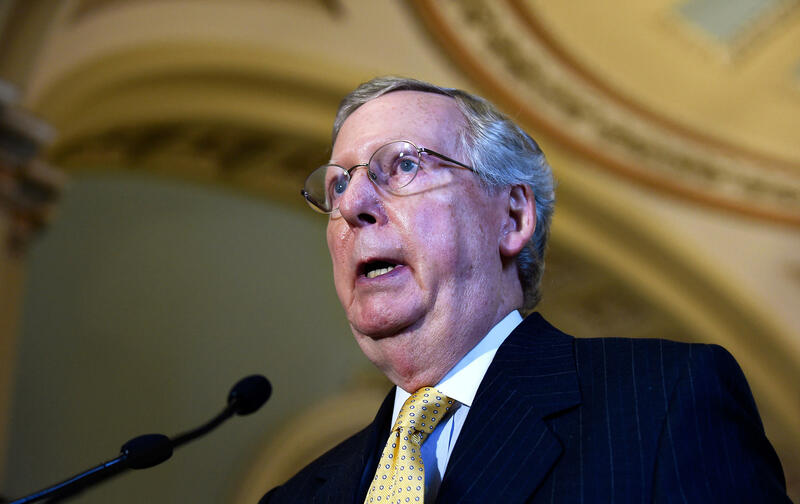 Videos shot by members of an anti-abortion group posing as fetal tissue middlemen "absolutely shock the conscience," McConnell said at a news conference last week. Those videos purport to show Planned Parenthood officials discussing the sale of tissue from aborted fetuses in strikingly casual terms. It is illegal to profit from the sale of fetal tissue, though not illegal for expenses involved in its collection to be reimbursed. Planned Parenthood says the videos are heavily edited and take discussions out of context. "These videos are hard for anyone to defend and hit at the moral fabric of our society," said the bill's lead sponsor, Sen. Joni Ernst, R-Iowa. "Planned Parenthood is harvesting the body parts of unborn babies." Ernst's bill would have not only made Planned Parenthood ineligible for federal grant programs like the federal family planning program, but also would have banned it from receiving reimbursement from Medicaid for other health services it performs for eligible men and women, such as testing and treatment for sexually transmitted diseases. According to the group's most recent annual report, 41 percent of the $1.3 billion received by the national group and its affiliates came from government sources. Under a series of laws including the Hyde amendment, none of the federal funds can be used for abortions, which account for 3 percent of the services Planned Parenthood provides. Yet even though abortion is a small part of what Planned Parenthood does, the group's enormous size makes it the nation's largest single provider of the procedure. The debate is in fact all about abortion, according to Dawn Laguens, executive vice president of Planned Parenthood. "They don't care about fetal tissue research," she says of the groups targeting the organization. "It is just an angle to go after safe, legal abortion." Asked if the goal was to eliminate funding for Planned Parenthood, fetal tissue research or both, David Daleiden, the head of the Center for Medical Progress, the group that took the videos, said in a statement: "The goal of our investigation is to reveal the truth about Planned Parenthood's trafficking and sale of aborted baby body parts for profit, which is illegal and unethical. Taxpayers should not be paying for these atrocities against humanity." But while the tie to fetal tissue is new, the fight to separate Planned Parenthood from its federal funding is, in fact, older than the 26-year-old Daleiden. In 1982, when Ronald Reagan was president, his administration issued the so-called squeal rule, which sought to require family planning providers, including Planned Parenthood, to notify parents when providing contraceptives to minors or lose their funding. Planned Parenthood sued and won in federal court, where the rule was found to be a violation of patient privacy. In 1987, the Reagan administration issued what came to be known as the "gag rule," which barred recipients of federal family planning funds from counseling or referring patients for abortion, and which required physical and financial separation between contraceptive and abortion services. Planned Parenthood and others sued again, and the case eventually went to the Supreme Court. This time the government won, but the rules remained mired in lower courts and were never fully implemented. President Bill Clinton erased them on his first day in office in 1993 by executive order. Planned Parenthood was back on the hot seat in the 2000s, as new "direct action" groups decided to take the fight in a different direction. In 2011, the anti-abortion group Live Action released a series of videos charging that Planned Parenthood was failing to act in apparent cases of sexual abuse leading to abortion in minors. Republicans in the House helped use those videos (which were later found to have been edited to make them misleading) to pass an amendment to defund Planned Parenthood. The Democratic-led Senate never acted on the measure. But even those inclined to support Planned Parenthood say the allegations around the sale of fetal tissue may represent a turning point. "The imagery is terrible," said Alta Charo, a professor of law and bioethics at the University of Wisconsin. This is also ironic, she says, because there has been a fairly broad bipartisan consensus in favor of using tissue from aborted fetuses in research for many years. A panel appointed during the Reagan administration in 1988 voted overwhelmingly that such research was ethical. "They went through all of the arguments, like 'Does it make you complicit and evil if you take advantage of what had been a legally aborted fetus and you think that abortion was evil?' And the answer was, 'Well no, because we have transplants of organs of homicide victims all the time,' " Charo said. "So even if you call it a homicide, we take advantage of it." Meanwhile, groups looking for possible cures for devastating diseases, and seeing potential breakthroughs in other countries, urged Congress to cancel a federal funding ban on fetal tissue research imposed by Reagan and continued under President George H.W. Bush. That support was demonstrated in a bill to update programs at the National Institutes of Health. Among the Republicans who joined the overwhelming support for the measure in 1992 were not only McConnell, but also Sens. Charles Grassley, R-Iowa, and John McCain, R-Ariz.
Bush vetoed that bill, as promised, and while the Senate voted almost as overwhelmingly to override the veto, the House fell 10 votes short of the two-thirds majority needed. President Bill Clinton overturned the ban by executive order in 1993, and federal funding for fetal tissue research was formally authorized in a similar NIH bill passed later that year.